Introduction. NAPD was born in at the University of Dayton Law School 5 years ago. So when we gathered in Baltimore on October 20 to celebrate our beginning, we had much to be thankful for. But we also had other business. Since that day in Dayton, the nation has been embroiled in its original sin, slavery, Jim Crow, and now this—the killing of Michael Brown, the killing of Taquan MacDonald, and so many more. Public defenders have been witness to it all. Out of the pain of the last five years, a Racial Justice Committee was also born, a committee now consisting of over 100 NAPD members. It was this committee that planned the training that took up most of October 20th. If you were there, you know it was awesome. If you were not there, you can see it all on MyGideon here. I blogged throughout the event, missing much of what was said. However, if you want a taste of the outstanding training, I have a summary over the next few pages. I would love to have typed fast enough to bring verbatim what was said, but I did my best. I would highly recommend watching the videos and viewing the power point presentations. Chant'a Parker spoke on the history of African Americans in the criminal justice system. Slavery is the original sin. Slavery lasted for over 300 years. 9.9 million Africans survived the voyage and were put to work in the colonies, Caribbean, and South America. 7% ended up in the colonies. 41% went to Brazil. The slave trade was about economics. Post-traumatic slave syndrome is described as a condition resulting from multi-generations of oppression of the descendants of African-American slavery. It's compounded by no opportunity to heal. Once slavery ended, reconstruction began, lasting from 1863-1877. Slaves were deemed to be “contraband” during the war, which allowed them to be seized and held as contraband. Their numbers became large. After the war, people came down from the north to begin to educate the “contraband.” During reconstruction, the majority in the House of Representatives of South Carolina were African-Americans. But Reconstruction didn't last long. Racial terror began during the period of Jim Crow. This lasted from 1877-1950's. The Red Shirts were a paramilitary organization that terrorized black folks. A Senator from South Carolina named Tillman was a member. Tillman killed a black South Carolina Senator who was on his knees begging for his life. He was the precursor to Dylann Roof. A statute of Tillman was placed on the grounds of the state house of South Carolina. It remains to this day. The number of black voters in Louisiana plummeted from 130,000 to less than 1300 in only 13 years. Present day police were preceded by slave controls. Policing began as an informal for-profit method of control. In 1838 the first publicly funded police department began in Boston. Another part of racial terror following the Civil War was lynching, in which 4000 African-Americans were lynched. Lynching peaked in 1940. In 1917, 100 African-Americans were killed in East St. Louis, Illinois. Blacks in New York organized in “silent protest”. 5000 joined the march. That year, Sen. Sam Bates got a bill passed creating the Shelby County Public Defender's Office. He had successfully defended an African-American who had been arrested for murder of a white woman. Our work as public defenders is a direct pushback of the oppression our clients face. The criminalization of blackness occurred during the years 1846-1928. The Condemnation of Blackness by Khalil Gibran Muhammad describes this period. People were describing blacks as different from others, deviant. Blackness became synonymous with criminal during the time. During this time, convict leasing resulted allowing people to be arrested and worked by businesses, plantations, and the like. In Sugarland Texas, over 95 graves were found of African-Americans, buried while being held as a result of convict leasing. The Civil Rights Movement preceded the period of mass incarceration. Imagine the state of black people and black families given this history? You have been denied housing, lost employment, revoked voting rights, and 1 in 2 black women had an incarcerated loved one. The time is now for the Road to Redemption. We are in the midst of the backlash to the Civil Rights Movement. Across cultures, darker people suffer most, throughout the world. The power of public defense in the face of all this is the anti-black activist in the criminal justice system. You have to see their humanity, and show it to law enforcement, prosecutors, and judges. Why am I a public defender? Because I know that every human being is worth more than the worst thing they've ever done. I am a public defender because black folks are presumed guilty. If you are silent about your pain they'll kill you and say you enjoyed it. At Neighborhood Defender Service we center our practice around being client centered. The client is the driver of the case and the process. We are also community based. You have to be based where your community is. Early entry is another hallmark of our office. Members of the communication can engage with an attorney early in the case. We are collaborative, working with both civil and criminal issues. We are holistic, meaning we are all about our clients. African Americans have traveled a long road. We are more than these things. There's a long way to go. There's a reckoning with this history and trauma that must happen. Public Defenders are especially equipped to do this work. Jeff Adachi spoke on litigating racial injustice. This country is getting woke. But we have a long way to go. Public defense should be the ones leading this. What do we do? When are you going to take a stand? You can do nothing, fearing that it will affect your other clients. There are opportunities all the time—we need to decide how we are going to respond. Strategically we have to think of all the possibilities. It may be limited by where you are, by the circumstances you are in. You have to put the client first and advance her cause. There are ways you can litigate racial justice issues. Understanding the dynamics of racism is important for litigating now. There were 745,000 black males incarcerated in the US in 2010. If the incarceration rates continue to grow as they are, 1 in 3 African-American males will be going to prison. The first thing to do is to get the facts, do a study in your jurisdiction. Work with a university or a think tank if you cannot afford to get the facts yourselves. In San Francisco, we did a 2-year study on charging practices. You need to de-bias yourself and your case. We do two mandatory implicit bias trainings each year. It makes us more aware and more effective advocates. Jury selection and voir dire are fruitful areas in which to litigate race. In your materials there are 400 pages of mostly motions on litigating racial justice issues. Bail is huge. We raise this in every case, in every bail motion. Our studies show persons of color are more likely to be detained. Raising the issue repeatedly has changed the dynamic in court. The first time you raise it, you are the outlier. By the 4th time, the dynamic has been changed. Use racial/cultural context experts. This helps juries understand on issues such as reasonableness. File a motion on charging and selective prosecutions. Motions to suppress arguing racial profiling, or in sentencing, are good areas to raise racial justice issues. Identifying disparities are important, but they don't necessarily tell why. We found it occurs in charging practices and confirmed throughout the system. The science of implicit bias says that we default to what we have been taught about race. It's important that we know this so that we can see this in jurors. Jurors will make assumptions based upon who they trust, who they believe. Studies show that where race is explicit, where it is talked about, it is less of an issue. If there is no mention of race, that is where a greater risk of implicit bias. Implicit bias is found even among the capital defense bar taking the implicit bias test. How do we de-bias ourselves? We need to examine the assumptions we are making about our client and our case. You need to conduct a full social history, visit your client's home and get to know his or her family, and get to know your client's community and neighborhood to get a sense of his or her history there. Litigating jury composition is important if there is underrepresentation. File a motion for expanded voir dire. I was forbidden by the judge from saying the words “black lives matter” during voir dire, but I was able to have a longer voir dire. Ask open ended questions when you are voir diring on race. Remember you can do challenges for cause based on racial bias. If possible, use questionnaires, which is the best way to get at the issue of racial bias. We are starting to win Batson motions. Look at the Foster case where Steve Bright got the DA's file which showed he highlighted the African-American jurors who were then struck peremptorily. There are two examples of motions on selective prosecution on MyGideon. Make a motion to get government statistics. Collect any evidence that shows an inference of bias or selective prosecution. There's a wonderful federal PD's motion in the Mumphrey case. You can file a motion on using blackness as an aggravating factor in death penalty cases. We have an NAPD Racial Justice Committee. There is a Blueprint for Racial Justice that is on MyGideon. NAPD has been at the forefront of these issues. Our goal is to have a Racial Justice Committee in every PD office. In our office, we had a goal of getting rid of the felony murder rule in California. They succeeded in overturning that rule. Natasha D'Artigue spoke on implicit bias. She spoke of stereotyping, prejudice and discrimination. All the information we have comes from our surroundings—parents, friends, school, media, direct or vicarious experiences, positive or negative associations. We all have a preference for a particular group. There's nothing wrong with preferences. We should all to take the implicit bias test at implicit.harvard.edu/implicit/. Research shows the test is a better predictor of behavior than explicit self-reporting. The attorney profession is 85% white and 64% male. This plays out in every aspect of the criminal justice system. Microaggressions are intentional or unintentional nonverbal, verbal, or environmental slights that communicate derogatory or hostile messages to the target person based solely upon their marginalized group. Studies show that victims of microaggressions experience more depression and anxiety. Microaggressions are everywhere. We cannot diminish another's experience. Our desire is for you to go back to your jurisdictions and continue these discussions. What are some debiasing techniques? Being motivated to be fair makes a difference. We need to expose ourselves, to broaden our base of knowledge. We need to “stare and not blink”. Be mindful of messaging and environments. Small messages can be affirming or inequitable. Derwyn Bunton spoke on working with the community. Derwyn's office has a Second Line for Equal Justice scheduled for November 3, 2018, in New Orleans. This has been an annual event. They go by the jail as they walk. Get your organization ready to work with the community. Inventory and identify your challenges. Confront your brutal facts, internally and externally. In New Orleans, the challenges have been conflict with the DA, the DA's charging staff with crimes, excessive fines and fees and bail. Community support is earned. To do this effectively, you need to prepare your organization to work with the community. Change may need to be done. You might need to change how you approach the community before you engage in an initiative. In order to do that, look at the values of your organization. If you want to work with community, make sure your culture is compatible with that work. Dignity, Justice, and Hope is the vision statement for New Orleans in OPD. If you are wanting to work with your community, ensure that your vision is consistent with what the community wants. New Orleans' strategy is outreach/public education, media advocacy, policy/legislative advocacy, mobilizing/organizing, and litigation. Build constituents. Recruit support and/or neutralize support, or opposition. Our natural constituency is our clients, their families, their employers. 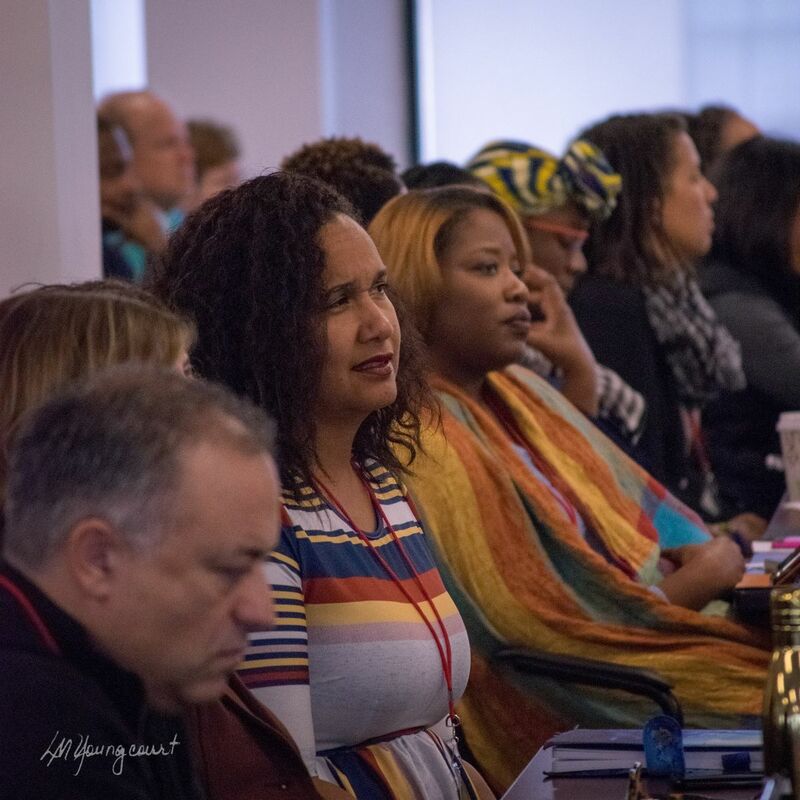 Define community—be expansive and inclusive but be especially mindful of who you represent and make special efforts to reach out and partner with those organizations most closely mirroring the people you serve. One of OPD's goals is to build a consequential constituency for action and advocacy. We are not powerless. Neither are our clients and their families. If you need help, it is likely going to come from your relationships with the community. Keir Bradford-Grey spoke on participatory defense. We need to be comfortable being uncomfortable. Do everything Derwyn just said. Sometimes public defenders are complicit in racial injustice. We become numbed to racism. We need to look to the community as the untapped resource. Participatory defense is that resource. Raj Jayadev is its creator. Raj helped me understand the collaboration between the community and the public defender organization. It prepares communities to understand the criminal justice system, understand and anticipate what is expected at each stage and each hearing, and get support to prepare for each step, and to access community-based resources that can help support them in what can be a long and isolating process. Participatory defense helps public defenders meet with clients who are better equipped and prepared to share relevant information, get information and intelligence from the client about the situation and context of their case, and prepare the best possible defense by having a full picture of the client and their circumstance. Participatory defense helps public defenders work better with decisionmakers, reduce racial bias in the criminal justice system, and build stronger community relationships. “Almost every night of the week, in this country, there's a participatory defense meeting with families sitting in a circle supporting each other…bringing in compassion and empathy but also intelligence and power from people who had no seat at the table.” In Philly, there are hubs in almost every part of the city meeting every night of the week. These hubs have facilitators who track every case and share information on how community support can help at every phase of the process. They help people prepare social biographies to tell their stories and organize volunteers to show up at court appearances to support defendants. Some of the policy solutions that came out of the hubs: determine whether the rate of minorities involved in the different stages is disproportionate; identify reasons for any disparity identified and the extent to which it is related to legitimate public safety objectives; assess the decision points where racial and ethnic disparities occur; design and implement strategies to reduce disparities; monitor the effectiveness of strategies to reduce disparities; capture more detailed race data; require training on “race-sensitive pretrial decision making” for all key justice system players. Other improvements: eliminate cash bail; empower communities; leverage technology to prevent FTA's; reduce the number of cases entering the system; limit cases eligible for pre-trial detention. Harold Winston and Lucius Outlaw spoke on litigating police misconduct. Winston related the history of misconduct by the police in Chicago, a long history, focusing on John Burge, one of the supervisors most engaging in torture and other misconduct. It culminated in a Task Force Report showing the gross disparity in the use of force and taser use. 76% of tasers were used against blacks, 13 against Hispanics, and 8% against whites. Chicago is 32% black, 31% white. A Civilian Office of Police Accountability was created. DOJ finished a report just before President Obama left office. The DOJ report strongly condemned the history of police misconduct. A consent decree resulted. Professor Lucius Outlaw was a federal public defender for 9 years. He spoke on the “Bout time” case of the Baltimore Gun Task Force. It was “about time” somebody did something about these guys, 7 of whom have now been indicted. The BGTF were known as the “jump out boys”. They were rewarded with securing lots of convictions and getting a lot of guns off the streets. Eventually 8 of them were convicted, with sentences of up to 20 years. Once the convictions and sentences were over, other defendants involved with the dirty officers began to raise questions about their convictions. Professor Outlaw was assigned the case of securing relief. He recommended a system for tracking cops with their cases. Form a bad cop team in your office, collecting Giglio type information. This will help spot trends. Make sure your office has a protocol for filing and maintaining discovery for closed cases. Establish formal contacts with state and federal defender offices for information sharing about officers/agents. Don't assume that prosecutors investigating officers are keeping other people informed about the cases. Believe your clients' stories and find means to press their claims of police misconduct. Defenders were complicit in the BGTF getting away with it so long. Patrice Fulcher and Jeff Sherr facilitated a discussion envisioning the future for NAPD. Some of the comments made during this discussion. What's NAPD look like in the future? Jeff Sherr: an online academy is now training tens of thousands of defenders around the country. Lorinda: my social worker has been certified by the online academy. Melanie: as a recruiter, I know the best people are those who have been certified by the NAPD online academy. Renate: I'm using the online academy to prepare to apply for jobs. Gina: I attended the online academy and met other supervisors who are connected to help me solve problems. LaMer: I am a solo practitioner who now has a virtual organization to help me moot racial justice issues. Ideas were generated, such as: a specialized trial school, a pipeline from law school, a traveling roadshow faculty available to PD offices, regional structure to meet and handle local issues, NAPD PD Grants for innovative programs, standards for employment practices to ensure a diverse workforce, amicus support throughout the states, a forensic expert database, a regional structure to meet and handle local issues, a MyGideon that is easy to navigate, places where we could ask questions, more training on participatory defense and how to implement it in our local community, more information self help available, having resources for communities to access how to establish participatory defense, prison litigation and prison reform, a big endowment that could fund roving trial teams for rural communities and forensic and racial bias litigation, an endowment that would fund NAPD law fellows, the NAPD leadership should reflect the client population, a national data bank of certified interpreters, setting up a permanent position in every office that would be a PD liaison. Whew! I'm done typing. It was a great day. And again, look at MyGideon.